Shevat is the eleventh month of the astrological year and its sign is Aquarius. The Kabbalists teach us, that each month is being controlled by a spiritual frequency represented by one of the permutation of God’s name, The Tetragrammaton – יהו”ה. According to the Zohar, each permutation is encoded as the initials of a certain verse from the bible. The permutation for Shevat is היו”ה (Hei Yod Vav Hei) and it is coded in the in the initials of the verse – “המר ימירנו והיה הוא” (“…and if he converts it at all, then both it and that for which it is converted to shall be holy…” – Leviticus 27,33) which indicates the powers of Shevat to make transformations and have changes in our life. The “Bnei Yissaskhar”, a kabbalist from the 19th century, claims that Aquarius is the sign of Israel. The Torah tells us about Jacob the patriarch, that his name derived from the word Akev (heel עקב) due to the fact that that when he was born he held to his brother’s heel trying to come out first. The heel is the roughest and the lowest part of the human body and it connects us to the earth. The Torah also tells us that after Jacob struggled all night with the angel, the angel was forced to bless him in order to be released, so he changed Jacob’s name into Israel ישראל, which combined of the words לי ראש (my head). Meaning, the heel was raised to be the head, and that indicates of the Aquarius ability to transcend above boundaries and overcome limits and boundaries. Aquarius people have no tolerance to the things that connect everyone else to the earth – habits, tradition, commitments, etc. They have to exchange boundaries with freedom. The “Bnei Yissaskhar” explains that the prime action of the bucket (Aquarius in Hebrew id Dli – a bucket) is to pump and draw water. This is its role – to draw from one place to another, and on Shevat it allows us to bring abundance and bliss from the upper worlds into our life. This is also why this bucket is the symbol of Cornucopia in many astrological traditions. According to Kabbalah, each of the seasons is represented by one of the letters in God’s name, The Tetragrammaton – יהו”ה. The spring is represented by the letter י (Yod) and so on until the winter which is represented by the letter ה (Hei). This symbolizes our world, the vessel that receives and accumulates the spiritual abundance from the upper worlds. All of the winter’s Signs (astrologically) have the essence of a vessel – the desire and the need to receive and get fulfilled. On each season the three astrological signs create an alignment of three energetic forces – called in Kabbalah right, left and central columns (plus, minus and a neutral, respectively). Aquarius is the second sign of the winter (left column, minus), which means that it contains very strong forces of attraction, drawing and a desire to receive. Hence is the intensive ambition of the Aquarius, their tendency focusing in achieving their goals, and their stubbornness and the difficulty to destruct them. Being related to the air elements, which characterize with great intellect, also explains the great desire of the Aquarius for knowledge. This implies to the two opposite sides of the Aquarians. On one hand, they are very selfish, individualistic and always occupied with themselves. They cannot be restrained or restricted. Their freedom is essential for them and if necessary they will fight and struggle to break down the walls and barriers that others put around them. We can also see how through the last centuries the walls of slavery fall one after another while human kind achieves unprecedented levels of freedom in the areas of human rights, technology and politics. On the other hand, Aquarians love people and easily socialize with them; however, their selfish nature prevents them from emotional commitment. That explains why in our generation, known as The Age of Aquarius, people tend to abandon the traditional family structure for their own careers, where they have plenty of acquaintances but few close friends. According to Sefer Yetsira (The Book of Formation) – attributed to Abraham the Patriarch – the building blocks of the universe consist of 22 different frequencies, spiritual forces, represented by the 22 Hebrew letters. Each month is ruled by two Hebrew letters. One letter rules the planet that dominates the sign. The other letter rules the astrological sign of the month. Shevat’s planet is Saturn and is ruled by the letter ב (Beit). Its astrological sign is Aquarius, which is ruled by the letter צ (Tsadik). People of the sign of Aquarius are also related to redemption and the arrival of the Messiah. The connection between them is the enormous hunger for drawing knowledge from the universe. Knowledge is power and also the base for true freedom. The redemption will come when we all are Tsadikim (righteous) – hence the letter Tsadik (or Tsadi) צ , when everyone converts their selfish desires into receiving only for the purpose sharing. The letter צ (Tsadik) represents the spiritual power behind Aquarius that also represents the connection between the upper spirituals worlds and our material world. This connection manifests in Tu BeShevat (Shevat 15th , the full moon in Aquarius) – The Year for the Trees – the Ilan (trees). The numerical value (Gematria) of Ilan (אילן tree) is 91 which is the connection between God’s name, The Tetragrammaton יהו”ה which represent the upper worlds and its value is 26, and God’s name אדנ”י which represents our material world and its value is 65 (and together 91). 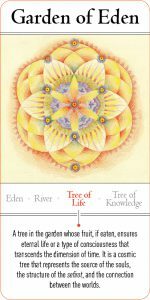 The physical tree represents the spiritual Tree of Life. As the material physical tree has a revealed part (trunk and branches) and a hidden part (roots) so is our reality – our physical body and our soul. The same way the tree grows opposing gravity, so are Aquarians, going against nature and what is acceptable. This is the power of life – to be creative and original. This is the purpose of us all, to connect to the abundance that The Age of Aquarius is offering us, to the tree of life and to the arrival of the Messiah. As Rav Ashlag, the founder of the modern Kabbalah movement, said that every person is unique and his purpose is to bring something to our world that only he can bring, and when each of us will fulfill his destiny and share it with the rest of mankind we will finally experience the redemption and The Age of Aquarius will come to its completion. To listen to the lecture on Shevat and other months, enter the Live Kabbalah University.